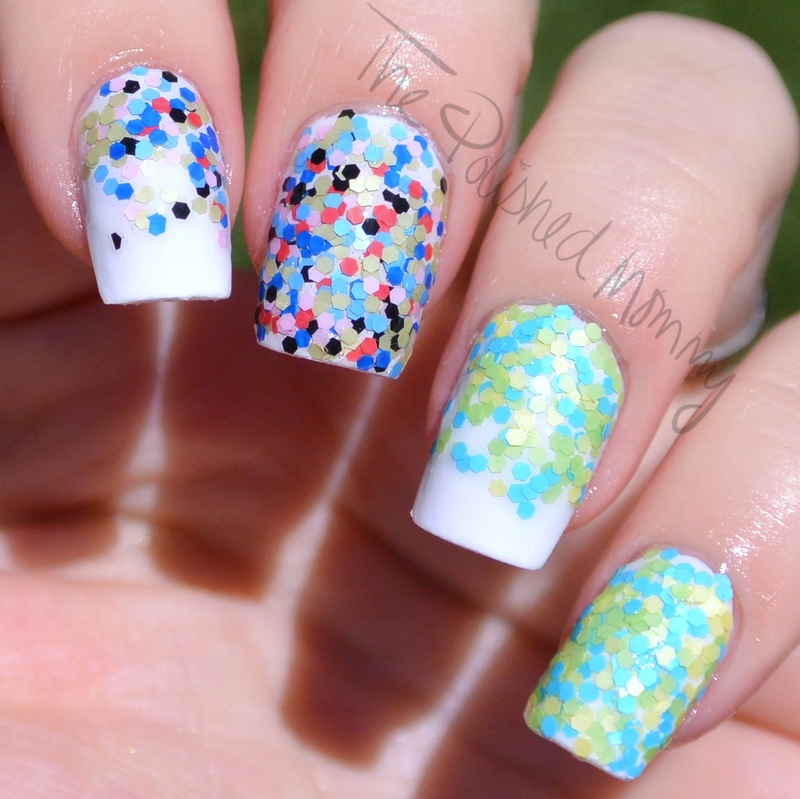 Sally Hansen Xtreme Wear Rio Glitters…. Today I have 2 of the glitters from the new Sally Hansen Xtreme Wear Rio collection, Samba and Carnival. Samba is a mix of small chartreuse, yellow and vibrant pale blue matte hex glitters in a clear base. I applied these over SH Xtreme Wear White On using the sponge method . The base is on the thick side and I feel the best way to get a glitter packed nail is to sponge it on, if you apply it directly to the nail the glitter will go on sparse and since the base is thick it will be difficult to get full coverage. Carnival is a mix of small red, black, muted yellow/green, pale pink, blue and vibrant pale blue matte hex glitters in a clear base. I applied these the same way as Samba since the base is the same. I did notice slight color bleed from the red glitter which tinted the base with a touch of pink. Using the sponge method the base pretty much goes away so the tint is a non issue but if you applied this straight to the nail, over white, you will notice some discoloration. Overall: The only issue would be the thick formula, but I much prefer to sponge it on in order to get maximum glitter coverage without layers and layers of polish. I think these are really fun and would look great layered overall a multitude of colors! Price: These retail for $2.99 and are available wherever Sally Hansen products are sold. Trick or Treat at the Graveyard….